TOKYO -- Mazda will pull the curtains on the next-generation Mazda3 small car at this month's Los Angeles Auto Show, kicking off a new era of performance-oriented vehicle platforms and Skyactiv-X drivetrains, all wrapped in a voluptuous new design language. A teaser shot released Thursday by Mazda Motor Corp. offers glimpses of both, with their rounded bodywork showcasing the reinterpreted vibe of the brand's Kodo design look. 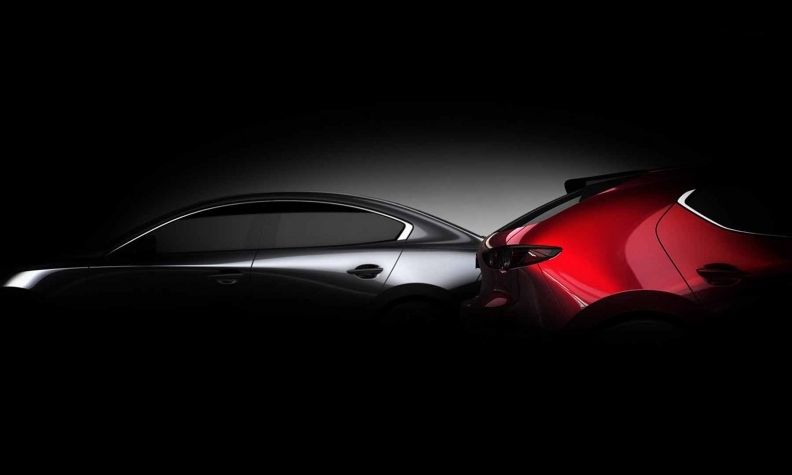 But the Mazda3 embodies more than just new styling. The compact car is the leadoff nameplate for an entirely re-engineered vehicle architecture that the Japanese carmaker promises will weigh less, cost less and deliver a quieter ride with crisper handling and better rigidity. The new design language was previewed in the Kai Concept shown at last year's Tokyo Motor Show. The concept hatchback channeled a "less is more" minimalist Japan aesthetic. The new design ethos adopts more supple, simplified styling and ditches sharply creased and intersecting character lines.